I was so happy to be invited to contribute to Literacy Lava 9! This is a free pdf of tips for encouraging children to read, write, and communicate. It is full of fun activities including how to use maps or a scrabble game for literacy fun. There are articles on how to find great online stories as well as articles on how to "unplug" your child. I contributed an article on using rhyming to strengthen prereading skills. 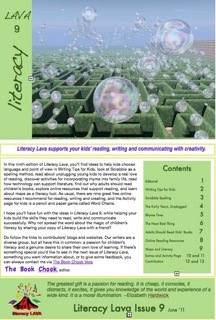 Literacy Lava was compiled by book lovers, bloggers, writers, teachers, and moms. Susan Stephenson at The Book Chook is the editor of Literacy Lava. You can find it on her website. I think you'll find something you can enjoy. And it is free! You don't even have to sign up for anything.